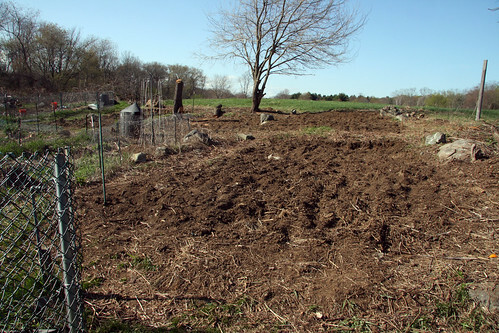 These are a couple of the new plots we cleared last weekend during our community garden work day. These plots were used years ago, but then abandoned when interest dropped about 10 or so years ago. We removed a large buck thorn tree that had overgrown the area and lots of raspberry canes. Then the soil was rototilled. One of the plots had become a compost area and the soil there looks incredibly good. I believe we will be assigning these plots in the next week or two - our waiting list, which is still more than 50. Great results from a great effort. I let our last plot yesterday, we are full now but still have a waiting list as you do. We want to keep the site full and buzzing so the borough council have more difficulty in trying to sell us off for housing again.